Well, this wasn't quite the path I wanted to take with my wagon, but so far things have worked out pretty well. 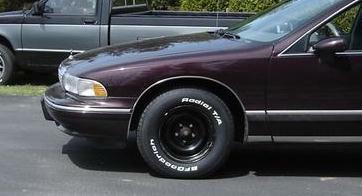 My original plan was to purchase some new Impala SS 17" x 8.5" wheels in 5x5 bolt pattern, throw on some 255/55 R 17 tires, and be done with my summer wheel set. I'd leave the stock wheels for winter snow tires. 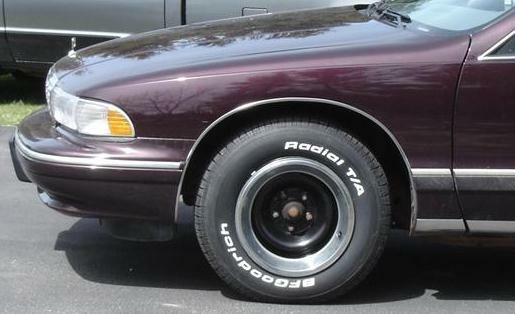 Well, Imp SS wheels are expensive, and so are the tires...about $1200 all said and done. I don't want to float that sort of money right now into just wheels and tires, so I needed another plan. 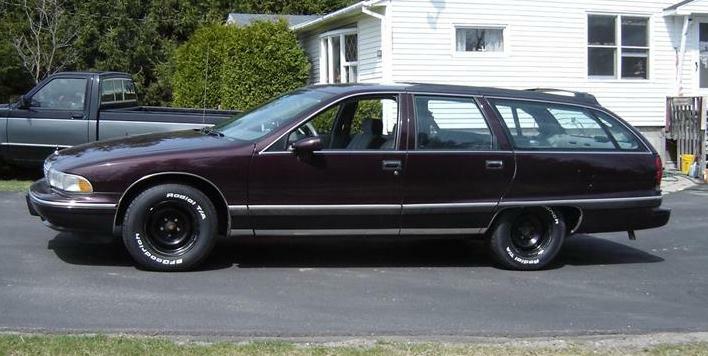 Below, the wagon as is...kinda a Junk Yard Dog sleeper look. So below, plain jane...I need to hide the hub if I do anything. I have a pair of 15" rusted out trim rings, they can't go on the car, but they give me a good view. I like it. I've got both metal and plastic rally hubcaps...these need little clips on the wheel to say which I don't have, but it gives me a feeling that chrome caps are good. I have a black set that I didn't take a picture of, and they are as good as nothing...all they would do is protect the hub. Finally my stock hubcap...nice...generic...but make my raised white letters look lame....no good, we'll save those for winter. And finally, my Grand Master Piece! 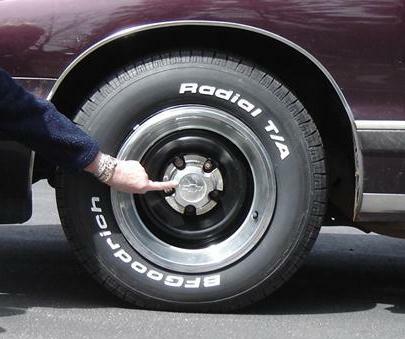 Actually, follow this link for the entire story, but for about $20 bucks a wheel, I've got GMC hubcaps (nice), Chrome lug nuts, and Chrome Trim rings. 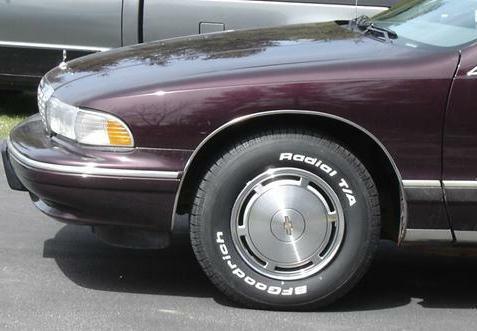 Time to save up for 17" Impala SS wheels and save these for winter!